Though C more so than B, both give me the impression of too much open space. What would people do out in the vastness of that plaza? Those tables look a little dubious to me. And the buildings across the street are so far away, and so many of them turn their backs on Alaskan Way, that they wouldn’t likely add much to the space’s activation. The challenge is that the distance between the pier buildings and the existing buildings to the east is too big to create a comfortable open space in between, but too small to fit in another row of typical buildings. 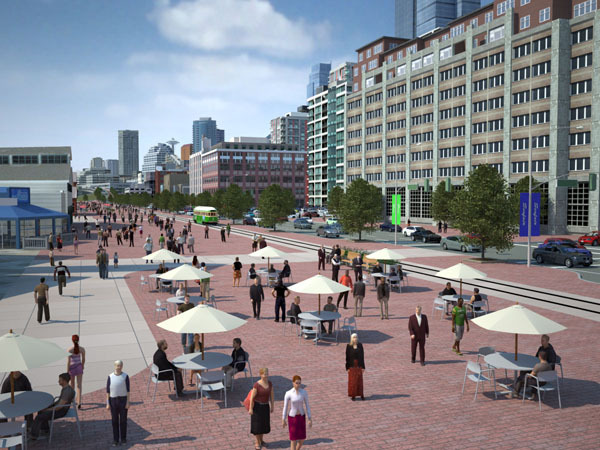 Creating a great place on the liberated waterfront is going to require going beyond just dropping in a street, streetcar tracks, and a wide swath of pavers: It’s going to take thoughtful and inspired urban design. My sense is that the waterfront open space would likely be more successful in the real world if it was tightened up. An open space needs more than a lot of open space to work. Just south of the Aquarium, Waterfront Park is a big space that never seems to have many people in it, and this has everything to do with what is and isn’t around it. One way to fashion a more human-scale open space and increase its activation would be to shift everything westward, and add a new row of narrow buildings or additions on the east edge of the boulevard. This would also give a reason for people to walk along the east side of the street. Perhaps the boulevard could be given some curves to accentuate gathering space focal points, such as the area at the bottom of Harbor Steps. There are tons of possibilities. Getting rid of the viaduct is just the first step. Next task: good urban design. Posted by dan bertolet on	Friday, November 21st, 2008 at 9:33 am. You can follow any responses to this entry through the RSS 2.0 feed. You can leave a response, or trackback from your own site. Yes, but what if it wasn’t a plaza and more of… an actual park? Like Waterfront Park down in Portland? Waterfront park in Portland has some mistakes that should be avoided: it’s a big open space, but it’s not a natural pedestrian-thouroghfare. It’s fun to jog through or take a stroll through, but it doesn’t really serve as a good place to let pedestrians get from point a to point b. This makes it a bit underutilized in my opinion, and, at least when I was there, it was a popular place for drug dealers. (still, it’s better than a freeway). Seattle could really learn from that, and I think that the best way to solve the problem is to get some permanent structures up. If a new row of buildings is difficult to push through, even just a few islands of commercial/residential would be helpful: then you could let street vendors take care of the rest. I don’t think this is a problem that needs a gargantuan solution: just a gentle nudge could really make a big difference. I guess the UW’s design ideas around ecological design didn’t make it with Marina Alberti on a committee with Buster Simpson. Ah, well. That’ll change when an EIS is done. None taken [michael]. I’d actually be surprised if these renderings were created by engineers – they don’t usually let us add people or textures to anything we do*. I just took a look at the Chopp Way renderings. Man that thing is ugly. * Just last week was the first time I’ve been asked what color I’d like something – it was a chiller in a 3-d rendering. I chose blue. 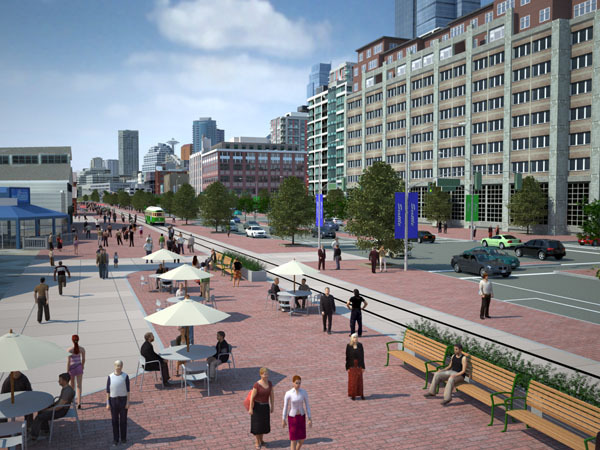 For better or for worse, they used paving and “open space” as paint in these renderings. I interpret much of the paver’d and populated areas as saying “this is where the cars aren’t”. But otherwise there is no urban design whatsoever. I’ve always seen the huge opportunity to be the existing buildings along Alaskan Way opening their “back” facades to the view and onto a multi-block urban park. Loading docks and historic brick facades would make for a great urban edge, with that elusive thing we call character built-in for free. Open restaurants on the loading docks a’la Yaletown in Vancouver, but with sunset views. Money! Yes not every existing block would be suitable but a good number of them are. Proposing blocks of new construction will tar any such plans as a “developer giveaway” which we all know is bad bad bad in Seattle. Remember the notion that SLU would become Seattle’s Pearl District? Well, uh, can we flip the script on that and do it on the waterfront? I would assume that where the pink pavers are is indicative of open space — not actual space that we intend to put pavers in. I also would assume that if we actually tear down the Viaduct the buildings along the way will slowly “turn around” to face the new, open pedestrian spaces — particularly if Western is going to be a fast-moving, one-way thoroughfare for cars. A number of the buildings already do open up to the waterfront because they were built pre-Viaduct. In addition there are at least two big parking lots with grand potential , as well as the Highway 99 Blues Club, and the OLD FIRE HOUSE which is currently in shambles but could be resurrected in some form to be great! Keeping the crossing distance small will encourage more meandering back and forth. I know the open space seems a bit excessive in Option C but whats the alternative, give it to cars? I agree that open space won’t make the waterfront great, and I’m sure for a number of years it will be awkwardly empty but thats not a good enough reason to make into a tire deadzone. I think adding some really pretty swales (like the boulevard near the sculpture garden) shrubbery, a few pieces of art, some street vendors/performers, and maybe a few pagoda bars/cafes, and it will be a wonderful place to relax on a summer day. How about this, getting rid of the bike-lane on Alaska Way (but keeping the one on Western) and adding a separated two way trail on the east side of the streetcar track. Oh man, now that would be dutch-style! What about a swale system incorporated UNDER the streetcar track. Then there could be little bridges where you can cross which would help improve saftey. I mean, i guess it could be next to it as well but either way a long skinny swale running the length of the waterfront, looking pretty AND cleaning our water for Puget Sound! He points out a lot of really amazing things that caused me to re-evaluate a lot of what I think about in parks. He has such dry wit too. I love it in the movie where they conclude that the biggest corollary to sitting is seats. Duh… but think about it next time you walk through a plaza that is devoid of life. I bet you it doesn’t have seats. You’ll get more enclosure when the trees get larger, lessening the sense of the dreaded “open space”. And surely, per Adam P, there will end up being more seating. Bottom line is: these renderings do little to illustrate the potential of the site. They won’t stand as drawn and require revision to receive community buy-in. “Swales” under the pavers can be done with Silva Cells and structural soil, but that’s a huge cost, and does little to ameliorate the urban heat island and sheet flow off the impervious. And the visual amenity. Far better for surface plantings (sez the landscaper and urban ecology-oriented green infrastructure guy). What’s the attraction of the Pearl? Dan S: large trees and abundant seating? Great, how do you protect them from mayors like Nickels (cf Occidental and Freeway parks)? I’m uninformed: is there any chance of more pier buildings? That would help with the “too much open space” problem and provide relief from my other least favorite part of the waterfront: wind. It seems like scenario C offers a lot of possibility for lightweight (or mobile) structures to help activate the space. Maybe little nodes of shops or restaurants? A bike station or two? A transit museum that straddles the streetcar track? Any structure like this also offers edges for landscaping for those bioswales. And there’d still be plenty of space for hot dog vendors. He won’t have a choice here soon. NPDES/TMDL fed rules will almost necessitate increasing tree canopy cover to comply with these rules, in addition to lowering peak flows after rain events to lessen scouring and lessening sheet flows of warm water into receiving waters with salmon runs. I hope as this process heats up that Seattle looks toward Vancouver’s fabulous Stanley Park waterfront area as a model…trees, plants, green spaces with plenty of pedestrian space and streets. I can’t imagine these two examples of concrete and pavers in a downpour without something to help absorb the road runoff! I would love to see downtown beaches, I don’t really think its feasible but if Vancouver can pull it off, why can’t we? Uh, any beaches along the waterfront would have to be artificial (due to the seawall) or would, at best, end up looking like the beach at Elliot Bay/Myrtle Edwards. Also, it’s not like Vancouver has public beaches in the heart of its downtown (Burrard Inlet) waterfront!